Sir Edward MacGyver dos Scorpus brings us information about scribes of the East and how to help them continue to make individualized masterpieces. Please contact Sir Edward through Facebook message to his mundane name (Edward Kurasz) for more information. I would love to take a minute and thank and recognize all the scribes out there. We just had one of our largest events, are you aware of all the scrolls that went out at Birka? With event season about to come into full effect with the wonders of spring, thinkabout all the scrolls about to go out. We of the East Kingdom are extra privileged, A wonderful scroll is created for almost every award or piece of business conductedduring courts. We have many wonderful new scribes who have jumped up to help meet these challenges, if you or someone you know who might be interested, you would be more then welcomed. Many Kingdoms don’t offer this. Scribes spend countless hours, days, and weeks preparing, drafting, and creating wonderful pieces of art that only a few people will ever see. Although Scribes do get a certain high, hearing the OOOOss and AAHHHHHss when the scroll is shown during court, many scribes never see their work go out.Those shinny bits and pieces, Scribes pay out of their own pocket to make scrolls, scroll paper/ vellum, paints, brushes, inks, calligraphy pens, and Gold and Silver, Yes!! Real Gold and Silver are added…. Folks often send out thank you notes and emails, but have you ever thought of how you could show your appreciation? Some people have offered donations of crafts, gifts, or other ways of appreciation “No Money Please!” The Scribes often get together for meetings, classes to improve their skill, and other functions. We have organized a Scribe chest for gifts…and nobody wants to see a running of the scribes…that would just be ugly. If you would like to donate or help out, please feel free to contact me, or stop by and see me or other Signet officers at an events. I am acting as the fundraising Deputy for the Signet. You’ve seen Crown Tournaments year after year. K&Q Competitions… been there, seen that. There was even Golden Seamstress, with sleepless, nail-biting races to the finish. But you’ve never seen anything like the Great Quintavian Iron Scribe Competition! You know scribes are always on a deadline. You know scribes are always battling curled paper, gold that won’t stick, ink blobs, and sleep deprivation. But you’ve never seen them in neck-and-neck races to the finish line! If we’re going to do battle and work fast, we may as well have fun with it. And maybe get something useful out of the deal, like finished backlog scrolls. Rubrics, be sure to read through these because they’re funny. Does this have a chance to crash and burn in epic fashion? Oh, yes indeed! How will we avoid it? By playing for fun, not for profit. If you’re in it to win it, well, good on you but the rest of us are going to have fun and enjoy the day. There are judges and points, but we all know this is a subjective exercise. Sloppy work is no good for either scribes or recipients. This is as much about strategic planning as it is about speed. Will you taste the sweet joy of the perfect acanthus leaf and the balanced S? Or will you suffer the agony of the crooked line and the smear? Only one way to find out! If the pen is mightier than the sword, then this may be the Mightiest Competition Ever! If you are thinking about attending, please fill out this google form so we can plan for the right number of people. (even just printing out your 3 favorite pieces), that would be great. New scribes are also very welcome. Please contact Mistress Eva Woderose with any questions. L’Office du Signet sera hôte d’une rencontre des Scribes du Royaume de l’Est à Pennsic, dans le campement Royal de l’Est le dimanche 7 août, à 2pm. De petites gâteries vous seront servies ! Ceci se veut une rencontre informelle: une chance pour les scribes d’apprendre à se connaître un peu mieux, d’apprécier le travail des autres, ainsi qu’une occasion pour l’Office de démontrer son appréciation pour le travail extraordinaire effectué par les scribes de l’Est. Veuillez amener vos portfolios ! Je sais que nous vivons tous dans une ère digitale, mais si vous pouviez possiblement emmener quelque chose qui démontre votre travail (même peut-être seulement imprimer vos 3 pièces préférées), ce serait fortement apprécié. Il est toujours inspirant de voir le travail d’autres scribes, en plus de pouvoir en discuter avec eux. Les nouveaux scribes sont aussi les bienvenus. Why You Should Thank A Scribe! Wording, layout, calligraphy and gilding done. Here, in the East, we are lucky to receive original works of art to commemorate our awards and honors, with the artwork, lettering and words created specifically for each recipient. (Please browse the Signet Gallery for some outstanding examples.) This is not true in every kingdom. 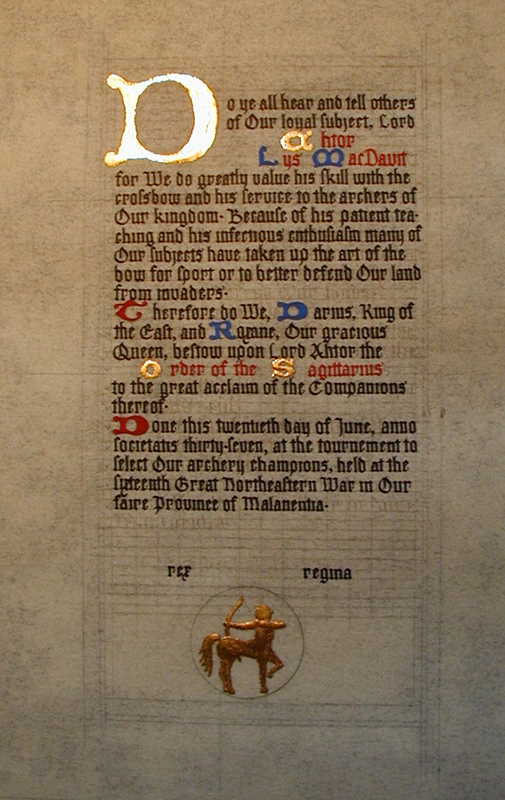 In some parts of the Known World, mass-produced documents are personalized to some degree, or recipients receive nothing from the Crown and commission their own documents, or in a number of areas individual scrolls are created but the text is the same for every recipient of a given award. Do you want to be a Scribal God/Goddess or just look like one? Greetings to the East! We are looking for teachers for ALL THINGS SCRIBAL! We would love teachers for all levels of classes. Do you want to teach but don’t know what to teach? Contact Honig or Camille and we can tell you what some of the “requested” classes are. For example, I would like someone who is very good at fixing mistakes to hold a class. Please show scribes how to scrape, dab, cover, fudge and fix those scrolls that need it. Nobody wants to learn how to fix on a scroll that is due in a few days. Do you have a talent for writing words? We would love to know some of your process! How do you make it look so easy? Do you have a little trick you would like to share? We are going to set up stations for the 30 Second Scribal University…for example: I want a refresher on how to use an Ames lettering guide but don’t need to sit through the beginning calligraphers class. Would you like to consult on scrolls? Someone may be having trouble with a small part of the process and the nearest scribe lives far away. We can also be reached over Facebook. Saturday, March 9, 2013.9:00am until 5:00pm..
Join the Provice of Malagentia and the scribes of the East for a day of scribal learning and camaraderie. We are currently seeking instructors for both beginner and advanced classes as well as a experiment called the “30-Second U”. The site is almost in NH so do not be an afraid to join us! Please check back for a class list and schedule as the date gets closer. We will have a manned scribal display so please plan to bring your work and a drool bib. We are also chaining our Laurel Mistress Carolyne de la Pointe to a table in the afternoon to be a scribal consultant… Would anyone like to join her? No preregistration for the event yet we would love to know what friends will be joining us. The event site is smoke free. No smoking anywhere on the site including the parking lot. A hearty dayboard is included with site fee.